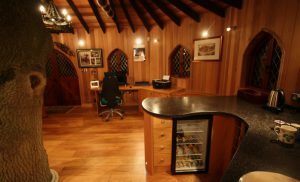 One glimpse of this Blue Forest treehouse will have you swiftly reassessing your assumption of what an office should be like. Located in the stunning Shropshire countryside, this building is not only ideal for working in, it’s the perfect place to achieve focus away from the rat-race. 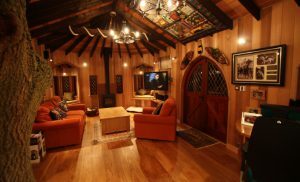 And when the day is over, it doubles as a spacious venue for guests or family gatherings. Working in the garden can be a pleasant idea, but it’s just not that practical for most people. 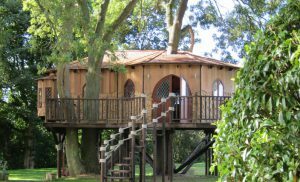 That’s why we’ve ensured the client has everything they could possibly need in this enviable working space – after all, treehouses are never just for working! There’s heating, lighting, a broadband connection and phone lines, not to mention Sky TV and a kitchenette that comes complete with a wine cooler. The interior is great for parties and relaxation with its spacious, rustic lounge area. But with an extensive veranda at the front and back of the building, there’s also plenty of opportunity to make the most of long summer evenings. 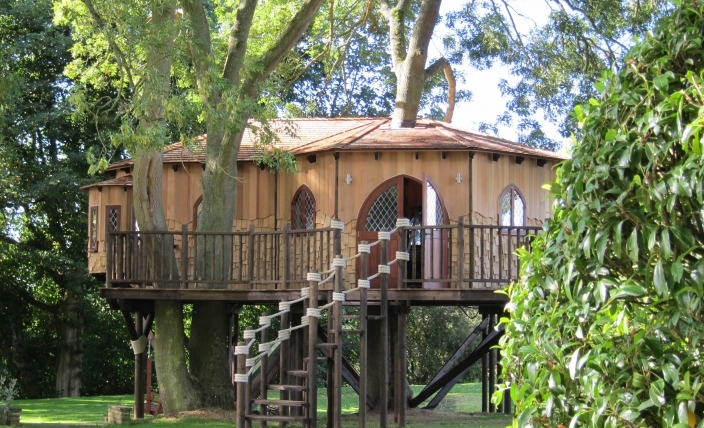 The exterior decks give somewhere for the kids to play with plenty of space for a table and chairs overlooking the majestic surrounding woodland area. To establish a harmonious relationship between the treehouse and the leafy location, we’ve used a variety of different timber species and textures to finish the structure. A number of elegant Tudor style windows provide plenty of natural light during the daytime. This makes for ideal lighting in a focused working environment. In the evening, soft, warm lighting contributes to a cosy aesthetic while wall mounted spot lights accentuate the timber on the walls and floors. 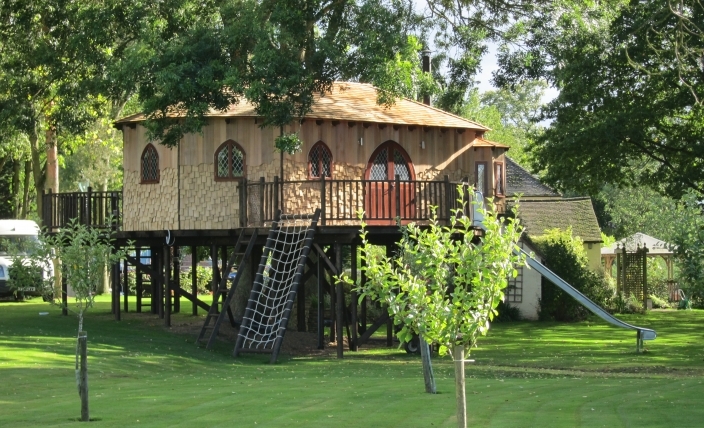 There are numerous routes for accessing the tree house including a winding wooden staircase with rope handrails. For a more adventurous ascent there is a scramble net and a slide offers a quick escape route! 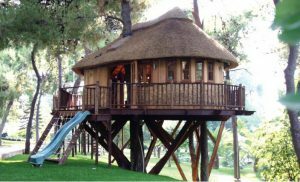 This Woodland Tree House is shaded by the surrounding trees to provide an adventurous outdoor play area and cosy spot for the children. 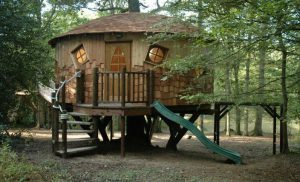 The quirky exterior of the tree house is lined with a combination of cedar tongue and groove cladding and randomly fixed cedar shingles. 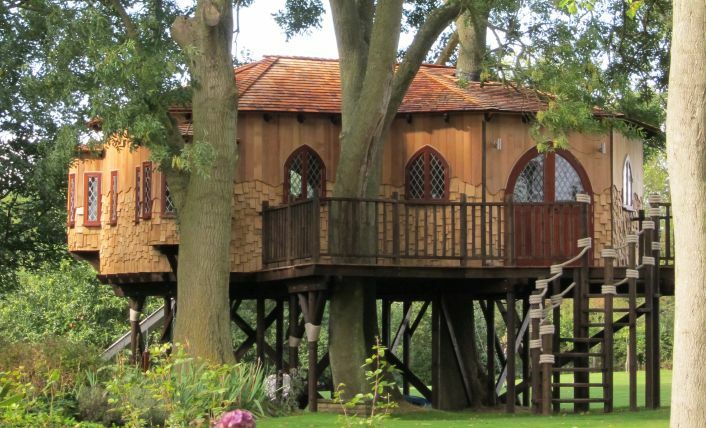 We have called this the Fibonacci Tree House! The organic shape was inspired by the geometry of the “Fibonacci Spiral”. This is a logarithmic spiral often found in nature, for example in the form of a snails shell.